Brief process description of each unit is given below. The plant is designed by Engineers India Limited to produce two grade of propylene Viz. Lean propylene of 75% purity suitable for the production of Cumene and Chemical grade propylene of 95% purity. The process scheme consists of two fractionation columns with the auxiliaries and equipment for the removal of COS (Carbonyl sulphide) as H2S from the hydrocarbon. The first fractionator acts as C3-C4 splitter producing 75% propylene as top product. The second fractionator functions as C3-C3 splitter producing 95% propylene as top product. Propylene from C3-C4 splitter is treated in Caustic/MEA and water washing system to remove the sulphur. This unit is based on UOP’s Catalytic Condensation process. This processing technique utilises a solid phosphoric acid (SPA) catalyst to promote the alkylation of benzene with propylene to yield high purity Cumene (isopropyl benzene). 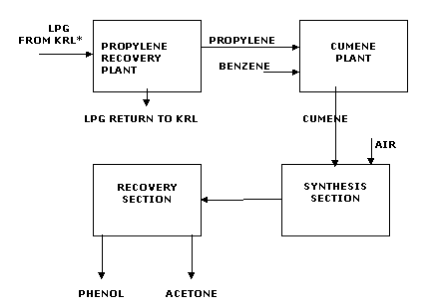 The overall process flow scheme consists of combining benzene with a propane – propylene mixture at select ratio prior to the reaction zone for insurance of maximum product quality and yield. This mixture is then heated and routed to the reaction zone, where the alkylation takes place over a solid phosphoric acid catalyst. The reaction zone effluent then passes through a series of fractionation columns for the rejection of non-reactants; recycle of the unreacted benzene and for the separation of the desired Cumene product from the heavier alkylated product. This unit is based on UOP’s CUMOX process, which is a commercially established Cumene per oxidation process for the economic and efficient production of phenol and acetone. The CUMOX unit has been divided into the following process section. In this section, CHP is concentrated in two steps from approximately 25-wt % to 80-wt%. Concentrated CHP from the evaporation section is fed into two parallel cleavage reactor circuit along with concentrated sulphuric acid catalyst. Under controlled condition of temperature and acidity, CHP is cleaved to phenol and acetone and byproducts. Neutralisation of the acid used as catalyst in the cleavage section. Washing of salts from the organic phase, which results from the neutralization. Recovery of phenol and acetone from several effluent streams. Springing of phenol recovered as sodium phenate from the effluent streams. This section mainly consists of six columns to separate and purify phenol and acetone and to recover Cumene and AlphaMethylStyrene (AMS). The alphamethylstyrene (AMS) is hydrogenated back to Cumene. The reaction is carried out over a fixed bed of catalyst. This plant is based on UHDE’s Ethyl Anthraquione process .2-Ethyl anthraquinone (2-EAQ) the effective reactive component is dissolved in mixture of solvent called working solution. It is reduced by hydrogenation using palladium catalyst in the first step and further oxidized to generate Hydrogen peroxide and spring back 2-EAQ. The hydrogen peroxide generated is extracted from the working solution using demineralised water. The working solution is recycled back to the hydrogenator and the above - mentioned reactions are carried out repeatedly. The weak hydrogen peroxide (35% concentration) is subjected to vacuum distillation to increase the strength to 50% or 70% as per the requirement. A small portion of working solution prior to hydrogenation is subjected to chemical treatment to remove or control the accumulation of side reacted products. The phenol and Hydrogen peroxide plants are provided with these service systems. The effluent from different plants is collected in equalization tanks. The combined effluent is then treated by physical, chemical and biological methods. The treated effluent conforming to the norms specified by Kerala State Pollution Control Board is only let out from the factory. The plant operations in Kochi unit are done with Distributed Control System , a class of latest state of art, where the data acquisition and control are carried through a number of microprocessor based control units distributed functionally and geographically over the Plant. We have three independent control rooms and DCS systems for Phenol Hydrogen Peroxide and Boiler operations. Apart from DCS , independent PLC and Relay based interlock systems are incorporated exclusively for the safety of the Plant. The Tank Level Monitoring System "LMS" gives the detailed stock of raw materials, finished products, and intermediate products along with various alarms , warnings and history of the tank operations etc. Automatic Drum filling of Phenol and Hydrogen Peroxide gives accurate weighment and safe operation. Computerized automated Truck loading system is incorporated for the loading of Phenol, Acetone, and Hydrogen Peroxide. Hydro carbon gas detectors are provided at various locations of the plant and monitored centrally to detect any hydrocarbon leak. Automatic Sprinkler system is provided in LPG Storage area for the safe operation of the LPG Storage. BOD/COD/TSS and PH of the final effluent are continuously monitored using on line analysers and data is sending to CPCB .